Obituary for Maurice L. Chenevert | Williams-Pedersen Funeral Home, Inc.
Maurice L. Chenevert, 81, of Largo, FL and a former Upton resident, passed away peacefully on Thursday, October 4, 2018, with his family by his side in the Tierra Pines Center in Largo, FL, after a long battle with Alzheimer’s. He was the husband of 58 years to Nancy C. (Black) Chenevert. Born in Worcester, he was the son of the late Henry and Loretta (Lussier) Chenevert. 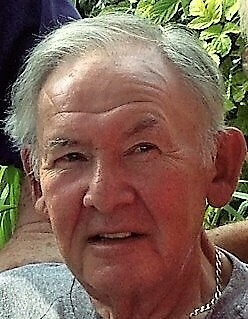 He was raised and educated in Northbridge and was a graduate of the Northbridge High School class of 1955. He loved sports. While in high school he received four Varsity letters in football, baseball, basketball and track. After high school, he enlisted in the United States Navy and was stationed in Morocco, North Africa. While there he played football for the Blue Jackets Morocco football team. Maurice shared his love of sports with children. He was a member of The Upton Youth Club for many years organizing youth sports. He coached basketball and baseball from Little League teams up to Babe Ruth teams. He also played men’s softball for many years with the Upton Men’s Softball League. During his employment of 28 years with General Motors in Framingham he participated in their bowling league. Maurice and Nancy spent the last 12 years as snow birds living in Largo, FL in the winter and summering at their beach house in South Kingston, RI. While in Florida, they never missed a Red Sox vs. Tampa Bay Rays game. They also enjoyed Red Sox spring training in Fort Myers, FL every year. After retiring early from General Motors, Maurice worked with his son Craig painting and de-leading houses for many years. Maurice and Nancy also traveled around the world before retiring to Florida. In addition to his wife, he is survived by two children, Teena Lee Chenevert of Whitinsville and Craig Chenevert of Webster; three grandchildren, Kenneth L. Murphy, Taylor J. Chenevert and Paige E. Chenevert all of Whitinsville; a great-granddaughter, Skylar Grace Murphy; and three siblings; Sandra (Chenevert) Benoit of Woodstock, VT, David Chenevert of Whitinsville and Peter Chenevert of Uxbridge. His funeral service will be celebrated at 11 AM on Saturday October 13, in the Williams-Pedersen Funeral Home, Inc., 45 Main Street, Upton. Burial will follow in Lakeview Cemetery, Upton. All are invited to The Grafton Inn, 25 Grafton Commons, Grafton, following his committal service for a collation. Calling hours will be held on Friday, October 12, from 4 to 7 PM in the funeral home. In lieu of flowers, donations in the memory of Maurice can be sent to Cure Alzheimer’s Fund, 34 Washington Street, Suite 200, Wellesley Hills, MA 02481 or by visiting www.curealzfund.org.